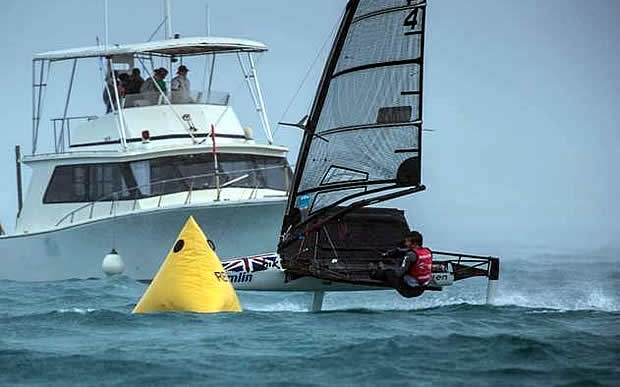 British Moth specialist Chris Rashley celebrated his 27th birthday today by winning Races 4 and 5 at the Amlin International Moth Regatta in Bermuda. Rashley overcame strong winds and near-blinding conditions, punctuated by a squall with gusts topping 30 knots, to take over the lead of the regatta which features US$10,000 prize money. With the wind blowing 18 to 24 knots as the fleet sailed to the race course on Great Sound some never even made it to the first start. By the end of the day at least half a dozen boats were brought back to shore on RIBs after suffering broken masts. Others suffered breakdowns that included broken booms, tillers and tiller extensions and other controls such as boom vangs and cunninghams. “I crossed the finish line doing 28.8 knots,” said France Moth sailor, former Mini Transat winner, Benoit Marie. “I think I was doing over 30 knots at some points, but I wasn’t able to look at the speedo all day, you know? It was crazy.